Posted on Fri, Apr 30, 2010 : 7:30 a.m. The red bud tree is in full blossom. Enjoy the sight, and take a few nibbles. Every spring is a chance to rejoice in Michigan’s flowering trees. The fall colors are wonderful, but they signal the quieting of nature. The spring blooms are a riot of color and signal beginnings and senses renewed. Eating flowers is a special sensuous treat. 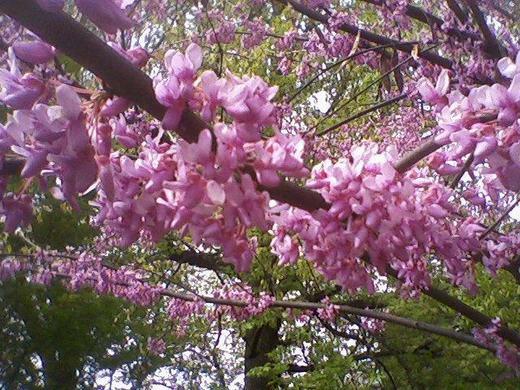 One of my favorites is the red bud, Cercis Canadensis. This is a gorgeous tree in bud, a vibrant reddish purple, deeper in color than the pink apple, cherry and crabapple trees also in bloom. Red buds are common in front lawns, planted as an ornamental tree. They are also abundant in many places on the Huron River. I hope you can envision a sunny spring day, the water is still chilly, but the sun is warm. Taking a slow trip down the Huron in a tandem canoe, enjoying the migrating birds, the Great Blue Herons, and the flowering trees. You pull the canoe up to a tree heavy with deep purple blossoms overhanging the water. From the canoe, you can easily take a few handfuls of still mostly closed blossoms from the tree, and eat them out of hand. Have you had a chance to appreciate spring so deeply? What do the buds taste like? A little sweet, they have some substance, the flavor is mild. Other foragers say it is a nutty flavor. I’m not sure. Maybe a low fat nut, but I need a heavier taste to find it similar to nuts. Harvesting a handful or two of blossoms per tree doesn’t harm the tree and leaves plenty of flowers to be enjoyed by both people and the long-tongued bees that pollinate them. While out of hand in a lovely setting is my highest recommendation (and it doesn’t have to be your hand - being fed flower blossoms by a very good friend is highly recommended) you can also add them to salads or cook them in pancakes or omelets. Flowers this lovely are also fun to use in special garnishes. Sprinkle on any food, in a drink, or as decoration on a cake. They are lovely but don’t last long. I mentioned the Huron River as one place to enjoy this lovely tree. Thursday night I attended the annual meeting of the Huron River Watershed Council (HRWC). The more I learn about this group, the more impressed I am. The Huron River is vital to Ann Arbor for drinking water, recreation and beauty. It is also the destination for runoff from nearby farms, lakes, creeks, as well as cities. In addition to a small group of dedicated professional staff, the HRWC effectively uses hundreds of volunteers to advocate and care for the river, create greater awareness of its ecology, and monitor and report on key indicators of the Huron’s health. The HRWC is quietly doing work vital to everyone in the area, most of whom take the Huron River for granted. There are always volunteer opportunities at the HRWC most of which get you out in nature and will help you appreciate this wonderful resource even more. Linda Diane Feldt is a local Holistic Health Practitioner, writer and teacher. She'll be offering a free weed walk for the Huron River Watershed Council June 12. Reach Linda Diane at ldfeldt(at)holisticwisdom.org, on her Web site, or you can follow her daily tweets on wildcrafting.